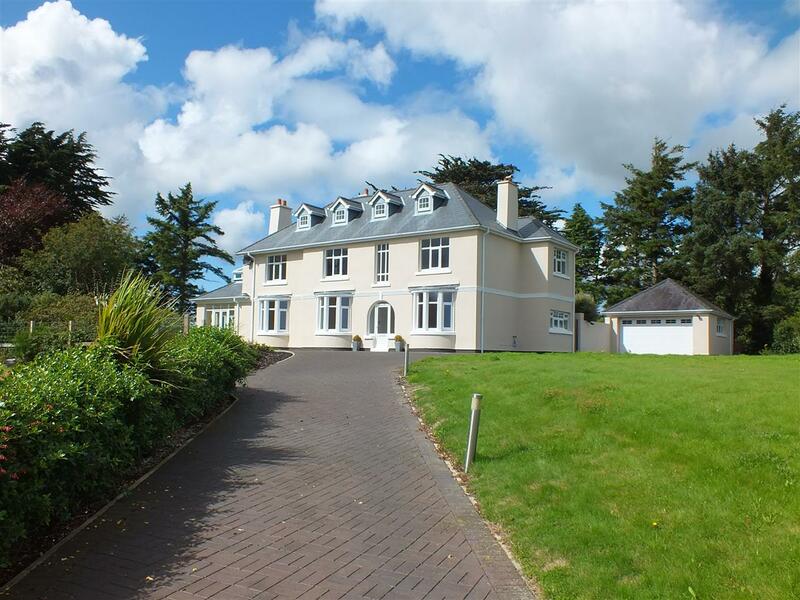 Spacious, Detached 4 Bed Country Residence with Accommodation Set Over 3 Floors. Situated in a Fantastic Rural Location with Outstanding Countryside Views. Gardens Extend to Approximately 2 Acres Including a Paddock to the Front. Offered in Immaculate Condition Throughout with a Stylish, Contemporary Finish. Underfloor Heating to the Majority of the Ground Floor. Spacious Lounge, Dining Room, Fabulous Glazed Atrium and Gym / Leisure Room. Fully Equipped Kitchen with Adjacent Breakfast / Family Room. Utility Room & Cloakroom. 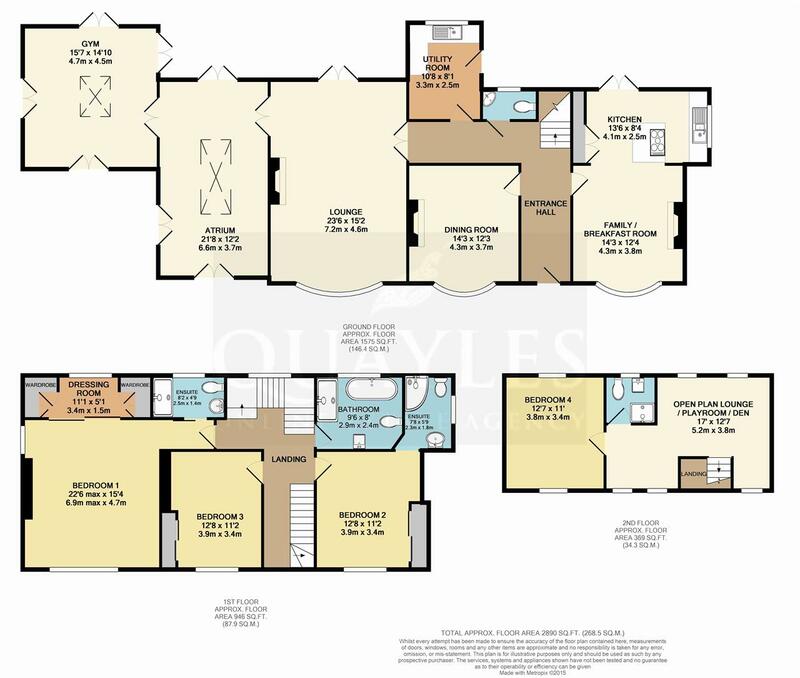 1st Floor - 3 Double Bedrooms (Master with Dressing Room & En Suite Shower Room). A Further En Suite Shower Room & Luxurious Family Bathroom. 2nd Floor Guest Suite / Teenage Den with Open Lounge, Bedroom & Shower Room. Oil Fired Central Heating & uPVC Double Glazing - Front Elevation Replaced in 2015. Sweeping Block Paved Driveway with Secure Electric Gate Access. Surrounding Landscaped Gardens & Orchard with Large Greenhouse & Wood Store. Travel in a Northerly direction from Ballaugh. Continue through Sulby and turn left at the Sulby Bridge. Follow the road to the end and turn right. Travel for approximately 1 1/2 miles taking the turning on the right signposted The Garey. Cronk Constantia will be found as the first property on the right hand side, being accessed via an impressive gated driveway. A feature uPVC door with glazed side panels and fanlight leads into the spacious entrance hall. Solid oak 'Xylo' flooring runs throughout the downstairs reception rooms with underfloor heating to the majority of rooms. A contemporary Oak staircase with stainless steel risers and toughened glass ballustrades leads to the first floor, with a uPVC window at the half landing providing additional natural light. Enjoying fabulous rural views via a uPVC circular bay window. An inset contemporary styled gas fire provides a further focal point with recesses to either side. Chrome radiator. Clear opening to the kitchen. The well designed kitchen is fitted with an impressive range of 'Rempp Kuchen' storage units including pull out racks, drawers and base units. Integrated appliances include fridge, freezer, large 'Wolf' self cleaning double ovens, microwave and dishwasher. The wide island / breakfast bar also incorporates a large 'Wolf' ceramic hob with an 'Elicia' suspended circular extractor above. Steel edged work surfaces have an inset 'Franke' one and half bowl sink with mixer taps. A uPVC window overlooks the landscaped gardens to the side of the property whilst glazed uPVC French doors open out to the patio area. Television point and small wall mounted TV. Directional recessed down lights and glass ceiling lights. A uPVC circular bay window provides fabulous views over the hills and countryside. An inset 'Stovax' multifuel burner with recesses to either side provides a further focal point. Recessed halogen down lights. TV and satellite connections. The oak 'Xylo' flooring continues through into this large, dual aspect room with a circular uPVC bay window to the front elevation and glazed uPVC French doors opening to the rear decking area. Wall lights and recessed halogen down lights. Featuring a glass fronted, inset 'Stovax' multi fuel burner with a slate hearth. Television and telephone points. Toughened glass, Italian double doors open into the atrium. A fabulous addition to the property, flooded with natural light by not only the three sets of uPVC French doors to the front side and rear respectively but also the cathedral style uPVC roof window. Toughened glass Italian double doors open into the gym / leisure room. Access to the enclosed entertaining deck. Slip resistant flooring. Television and satellite points. Similar to the atrium in design with 4 sets of uPVC French doors leading to the garden, patio and deck. The cathedral style roof provides a great feature too. Recessed halogen down lights. Television and phone points. A frosted, toughened glass door leads into the utility room which has been fitted with a range of base units. Work surfaces incorporate a stainless steel sink. Plumbing and space for a washing machine. 'Worcester' oil fired boiler. Recessed halogen down lights. A half glazed uPVC door leads out to the rear. Ceramic floor tiles. Airing cupboard housing the pressurised hot water cylinder and consumer units. A uPVC window looks out to the side. Fitted with a white suite of WC and circular hand basin. Obscure glazed uPVC window. Ceramic floor tiles. Featuring a frosted toughened glass door with a glazed block wall panel providing natural light. Ceiling spotlight fitting. A large uPVC window to the front offers fabulous views across the paddock to the surrounding countryside An oak and stainless steel open tread staircase with toughened glass ballustrades leads to the second floor. Recessed halogen down lights. Chrome radiator. Smoke detector. A fully tiled bathroom with underfloor heating which is beautifully presented and fitted with a contemporary white suite comprising freestanding, double ended bath with mixer taps, push button flush WC, wall mounted basin with illuminated mirror above and a large walk in enclosure with a fully plumbed thermostatically controlled shower. Obscure glazed uPVC window. Chrome ladder style radiator / towel warmer. Two illuminated display niches. Recessed halogen down lights. Extractor. A good size double room with outstanding views over the countryside from a large uPVC window. Built in 'Walnut' effect wardrobes with smoked glass sliding doors. Chrome radiator. Recessed halogen down lights. Television point. Clear opening to the en suite shower room. Fully tiled and fitted with a white suite comprising push button flush WC, pedestal basin with a large wall mounted mirror above plus a large walk in, glazed enclosure with a fully plumbed, thermostatically controlled shower. A uPVC window overlooks the side garden and countryside beyond. Recessed halogen down lights. Ladder style radiator. A further good sized double room with wardrobes to the recess featuring smoked glass sliding doors. Television and telephone points. A large uPVC window provides stunning countryside views. Contemporary chrome radiator. Recessed halogen down lights. An extremely spacious, dual aspect double room with fabulous hill and countryside views from a front facing uPVC window. Ample space for a 'Super King' size bed if required. Television and telephone points. Chrome radiator. Recessed halogen down lights. Large oak sliding doors lead into the dressing room. Includes a range of wardrobes and a dressing table unit with drawers to either side, in a cream and 'Walnut' finish. Offering a pleasant wooded outlook from the uPVC window. Recessed halogen down lights. Fitted with a white suite comprising a push button flush WC, walk in enclosure with a rain shower and a circular hand basin with storage beneath and an illuminated mirror above. Chrome ladder style towel warmer. A uPVC window to the rear elevation offers a wooded outlook. Recessed halogen down lights. A pleasant area suitable for use as guest accommodation, a teenage hideaway, home office or playroom. An open plan area which would be ideal as a study, teenage den, playroom or guest lounge. Having angled ceilings with uPVC dormer providing stunning views over the countryside. Doors to the shower room and bedroom. Chrome radiator. Recessed down lights. Smoke detector. Television point. Access to eaves storage space. A fully tiled room fitted with a contemporary suite comprising walk in enclosure with rain shower, oak vanity unit with a top mounted glass basin, and push button flush WC. Chrome ladder style radiator. The rear facing uPVC window offers a wooded outlook. Recessed halogen down lights. Extractor. Once again the angled ceilings add a charm to the room with dual aspect dormer uPVC windows. Television point. Chrome radiator. Directly to the rear of the property is a delightful walled garden with a paved patio and a timber decked area, ideal for family functions and parties. Timber gates lead to the side and rear respectively. Well stocked flower beds with a lawn to the centre. Exterior lighting. Water tap. Well stocked and landscaped gardens to all sides of the property with an abundance of mature trees, shrubs and flower beds. Timber fencing to the boundaries. There is a large paved patio area with access to the gym and atrium. A wooded copse with a discreetly placed wood store and sheds. Further down, past the wooded area and hidden from the house is another garden and orchard with a large greenhouse and vegetable patch plus an old pig sty, ideal for storage. Water tap. The sweeping block paved driveway with electrically operated gates leads up to the house and garage with a large parking and turning area. Mains water and electricity. Septic tank drainage system. Oil fired central heating. Underfloor heating to ground floor with the exception of the kitchen and breakfast / family room.